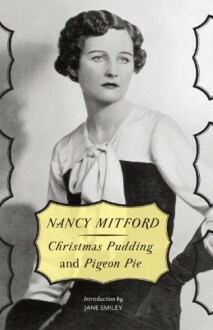 Christmas Pudding and Pigeon Pie are two sparkling comedies from early in the career of Nancy Mitford, beloved author of The Pursuit of Love and Love in a Cold Climate, here published in one volume with a new introduction by Jane Smiley. In Christmas Pudding, an array of colorful characters converge on the hunt-obsessed Lady Bobbin’s country house, including her rebellious daughter Philadelphia, the girl’s pompous suitor, a couple of children obsessed with newspaper death notices, and an aspiring writer whose serious first novel has been acclaimed as the funniest book of the year, to his utter dismay. In Pigeon Pie, set at the outbreak of World War II, Lady Sophia Garfield dreams of becoming a beautiful spy but manages not to notice a nest of German agents right under her nose, until the murder of her maid and kidnapping of her beloved bulldog force them on her attention, with heroic results. Delivered with a touch lighter than that of Mitford’s later masterpieces but no less entertaining, these comedies combine glamour, wit, and fiendishly absurd plots into irresistible literary confections.